ChemPubSoc Europe's journals, all published with Wiley-VCH, are: Chemistry—A European Journal, European Journal of Organic Chemistry, European Journal of Inorganic Chemistry, ChemBioChem, ChemPhysChem, ChemMedChem, ChemSusChem, ChemCatChem, ChemPlusChem, ChemElectroChem, ChemistryOpen, and ChemViews, the ChemPubSoc Europe e-zine. They replaced 16 traditional national chemistry journals. ChemPubSoc Europe and its Asian sister organization, the Asian Chemical Editorial Society (ACES), mutually support each other in the publication of their journals Chemistry—A European Journal, Chemistry—An Asian Journal, and ChemSusChem. Receive e-mail alerts when new issues are available online. Registration is easy, fast and free. The multicomponent cascade synthesis of biaryl-based chalcones was carried out in pure water and in an aqueous micellar system. The first step of the protocol was a simple Pd-catalysed, ligand-free, and aerobic Suzuki–Miyaura reaction in aqueous medium. The resulting intermediates then underwent an in-situ aldol condensation reaction to give biaryl(hetero)chalcones in good to excellent yields. Eur. J. Org. Chem., March 2, 2016, DOI: 10.1002/ejoc.201600095. Read article. A radical-ionic sequence between an allylic alcohol and an α-iodo acid in the presence of substoichiometric amounts of lauroyl peroxide (DLP) produced the adduct of an atom transfer radical addition (ATRA), which underwent an acid-mediated lactonization to afford the corresponding iodolactone. This approach can be described as a formal intermolecular iodolactonization. Eur. J. Org. Chem., March 2, 2016, DOI: 10.1002/ejoc.201600051. Read article. 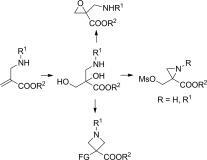 The dihydroxylation of N-substituted alkyl 2-(aminomethyl)acrylates afforded the corresponding 2-(aminomethyl)-2,3-dihydroxypropanoates in good yields. The resulting amino-1,2-diols were shown to be suitable substrates for the efficient synthesis (one to four steps) of small ring heterocyclic amino acid derivatives that incorporate epoxide, aziridine, or azetidine ring systems. Eur. J. Org. Chem., March 2, 2016, DOI: 10.1002/ejoc.201600036. Read article. 1,2,3-Triazole-derived mesoionic biscarbenes bridged by a pyridylene group are synthesized and characterized. The carbenes are thought to be partly reduced to anionic radical species in the presence of strong bases, which suggests that these moieties endow molecules with both electron-acceptor and -donor properties. A rare example of an iron complex with a pincer carbene is synthesized. Eur. J. Org. Chem., March 2, 2016, DOI: 10.1002/ejoc.201501626. Read article. 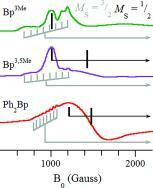 Solution spectroscopy of a series of five (RBpx)2Co complexes is reported. A frozen solution EPR study shows that all of the complexes have MS = 3/2 ground states, and offer insight into the complex EPR of pseudotetrahedral CoII. Eur. J. Inorg. Chem., March 2, 2016, DOI: 10.1002/ejic.201501356. Read article. A high-silica aluminosilicate zeolite with a TON structure designated as ZJM-4 was successfully synthesized in the absence of any organic templates and zeolite seeds. 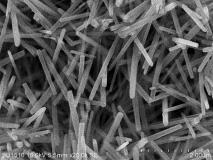 This route has efficient silica utilization, and the zeolite product has a stable tetrahedral aluminum species. Eur. J. Inorg. Chem., March 2, 2016, DOI: 10.1002/ejic.201501223. Read article.